As the controversial killing of tigress Avni in Maharashtra kicked up a row, Chief Minister Devendra Fadnavis said on Monday preliminary reports showed that the forest department team shot her in 'self-defence' after it was attacked while trying to tranquilise the animal. A first information report was lodged at the Sehramau police station in Pilibhit district on Monday against six persons and some unidentified villagers in connection with the alleged lynching of a tigress. The FIR was lodged under various sections of the Indian Penal Code and the Wildlife Protection Act, Sehramau kotwali police inspector Atar Singh said. In his FIR, Kishanpur sanctuary forest guard Mohan Ram implicated Bablu, Mukesh, Lal Bahadur, Chauthi, Subhash, Om Prakash and six unidentified villagers, he added. 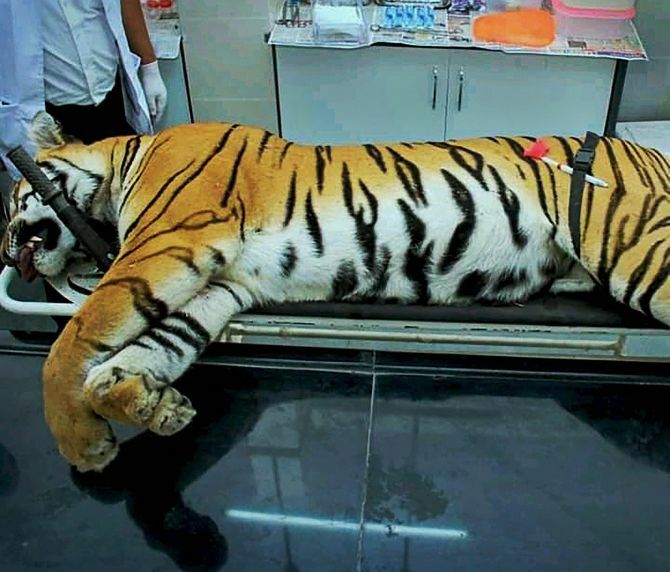 Meanwhile, a post-mortem of the tigress was performed at the Dudhwa Tiger Reserve office in Paliya town as per the procedure laid down by the National Tiger Conservation Authority (NTCA) to ascertain the exact cause of its death, DTR Deputy Director Mahavir Kaujlagi told PTI. The tigress was allegedly killed by a mob of angry villagers on Sunday evening after it attacked Devanand, 50, of Chaltua village, located in the Kishanpur sanctuary area of the DTR. The irate villagers allegedly held the DTR field staff patrolling the area hostage and manhandled them. The field staff, along with their elephants and tractors, were rescued on Sunday night after Kaujlagi sought help from the Pilibhit police. Meanwhile, DTR Field Director Ramesh Kumar Pandey, who, along with PCCF (wildlife) Pawan Kumar, Additional PCCF Sanjay Kumar Srivastava, Pilibhit Tiger Reserve Director H Rajamohan, Kaujlagi and two doctors from the World Wildlife Fund -- Mudit Gupta and Anil Singh -- was present during the post-mortem of the tigress, told PTI, "During the autopsy, it came to light that the tigress had both ante-mortem and post mortem injuries on its body which led to its death." He added that a porcupine quill was found to have injured the big cat's nasal tract. "A heavy load of worms seems to have made the big cat lethargic and stay at one place," Pandey said, adding that a thorough probe into the killing of the animal was on and appropriate action would be taken.